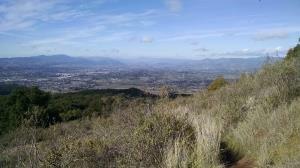 Looking back from the trail into Napa Valley. Coppertone and I returned to Skyline just a week after our first visit. On our first trip we had originally planned on heading to the top of Sugarloaf Mountain. But when we ended up near the back of the park we gauged the time of day and our fatigue to not be up to the challenge. Fast forward to today. We took the Manzanita Trail route and then started to the top of Sugarloaf as soon as we could. I found the views and trails more enjoyable than the Buckeye Trail we had spent the most time on in our previous trip. It does come at a cost though, and that's elevation gain. About 1500 feet of elevation gain from the trailhead to the summit. The views from the top made it well worth it. Descending down the far side of the mountain was an adventure. The official park map warns about a steep, eroded section of trail and they are not kidding. That segment might be easier going up than down. The backside also had the benefit of being completely shielded from traffic noise of any kind. Once we descended to Marie Creek we took the quickest route back to the trailhead, the trusty Lake Marie Road. I just realized that one year ago (Jan 2), Coppertone and I hiked at Sugarloaf Ridge State Park. This time we summited Sugarloaf Mountain. Is this some weird Sugarloaf New Year tradition that we're making for ourselves?